As we gear up for the long weekend here in Melbourne, I have so many books that I need to try and read before they are due back to the library, plus a couple on my e-reader that I need to read and review! 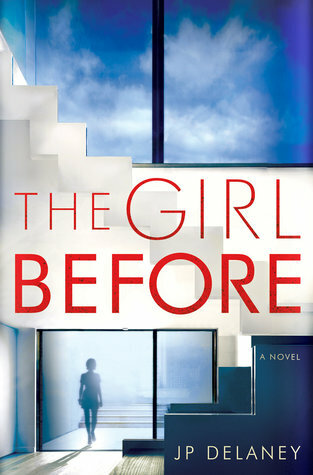 But, I have recently read The Girl Before, and I've been struggling to come up with the words to describe this psychological thriller. The story centres around two main female characters; Emma and Jane, and reverts back and forth between 'then' (Emma's story) and 'now' (Jane's story). Then: When we first meet Emma, she is dating a man named Simon, and they are looking for a new apartment to live in as they've been recently burgled and Emma doesn't feel safe in their current residence. They are shown a building called One Folgate Street. It is a very minimalist, high tech place. The architect owner is a man by the name of Edward Monkford. It turns out that Edward has a series of questions and unusual terms that he uses to select the tenants, and he makes it clear that no changes to the residence can be made in any way, shape, or form. Although they are a little put off by his terms, Emma and Simon move in, but there are a lot of issues that they face, and after some time, they part ways. Emma finds comfort in Edward, and they begin a relationship. But don't think for a second that it is an ordinary relationship..
Now: Jane is 34 years old, single, and recovering from having a stillbirth. She moves in to One Folgate Street after being selected by Edward. One day, she notices that flowers are left on her doorstep frequently, and at first, she assumes that they are from Edward as a way to welcome her into the apartment. But when she catches the flower bearer heading back to his car, she's shocked when he tells her that someone named Emma had once been murdered in the apartment. Jane is intrigued by this discovery, and she decides to try and uncover just what happened to the girl before her who'd lived at One Folgate Street. I won't give away too much more, but I will say that Edward is a character I disliked instantly. He reminded me a lot of Christian Grey. Dominant, and very controlling . The story has a lot going for it though. Its fast-paced, suspenseful, and definitely kept me turning the pages. The chapters are super short, and I often struggled with keeping track of whether I was reading about Emma or Jane, as they are very similar. It threw me off quite a few times, and I think that if the chapters had been a bit longer, it wouldn't have been much of an issue. I didn't like many (if any) of the characters but that is what made me want to keep reading! I've heard that The Girl Before is being made into a movie, so I'm curious to see how it is adapted for the screen. Are you a fan of thrillers? Have you read The Girl Before? I'd love to hear your thoughts!